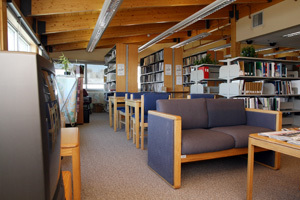 The Nunavut Legislative Library was founded in 1998 to provide library service in support of the Legislative Assembly of Nunavut, which held its first sitting on April 1, 1999. It provides service primarily to Members of the Assembly and their support staff, and also to Government of Nunavut employees and outside visitors researching the history of the Territory and the Assembly. The library has two staff, the Legislative Librarian and a Library Assistant. The library is located on the third floor of the Legislative Assembly building. The Legislative Library has been instrumental in developing standards for creating Inuktitut bibliographic records for Inuit language items, regardless of script, in order to properly describe the many government documents in these languages. Their collection contains many items in any of the official languages of Nunavut: Inuit language (Inuktitut and Inuinnaqtun), English and French. 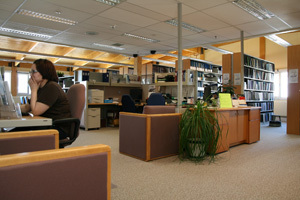 Their catalogue holdings can be accessed at the joint Nunavut Libraries Online OPAC: http://nuvt.vtls.com/cgi-bin/nuvt/chameleon. Many government documents are available in electronic format and can be accessed directly through the catalogue by clicking on available item links there. In addition to its collection of general materials on government and parliamentary practice, tabled documents and other Legislative Assembly session records, the library carries an assortment of newspapers and periodicals for the use of the MLAs and their support staff.